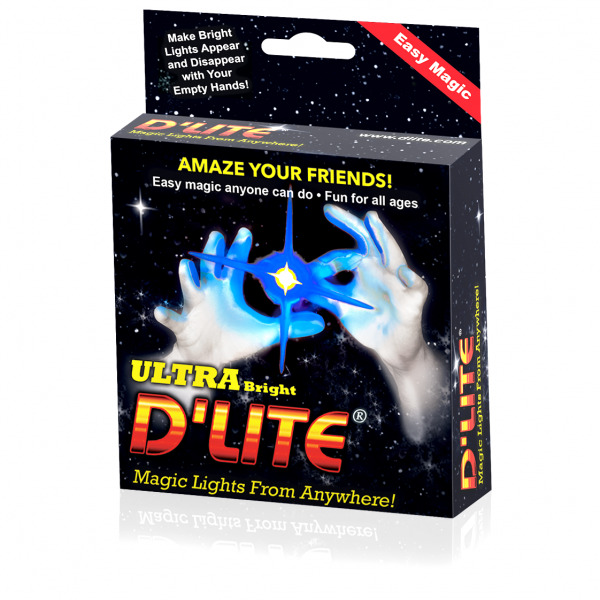 Show your hands empty and magically make D'lite Blue lights appear from anywhere you choose then disappear at will, all under your complete control at all times. You will absolutely amaze everyone with D'Lite. From children to seniors, it's easy magic that anyone can do. D'Lite is the greatest selling magic trick of all time. No other magic trick is so easy to and yet so powerful. Great for magicians, a natural for clowns. Make an ice cube light up in your bare hands. Make it appear and disappear at will. Put it through your ears. Great novelty. 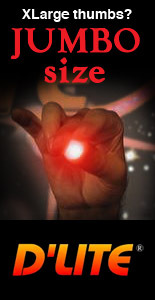 Amazing magic tricks and illusions for kids. Show your hands empty, pluck a bright Blue light out of the air then pass it from hand to hand and make D'lite disappear. Pretend to put one in your mouth, and pull it out of your ear or play catch with your friends. Hold an ice cube in your bare hands, and make it glow bright Blue at your command. An endless list of things you can do with D'Lite is limited only by your imagination. The D'Lite DII DVD (sold separately) is the best way to learn all you can do, handing techniques, and tips from D'lites inventor, Roger Mayfarth.